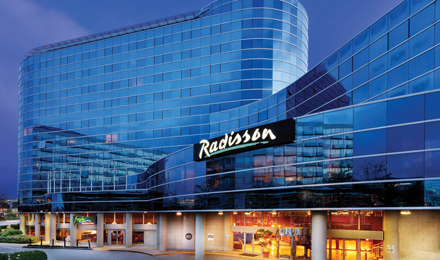 Leave travel stress behind when you check in at the welcoming Radisson Exhibition Center Shanghai, located in the scenic Qingpu District. Take advantage of our complimentary shuttle to and from Shanghai Hongqiao International Airport (SHA), 16 kilometers away, or use the shuttle to reach the National Exhibition and Convention Center (NECC). At the hotel, order a hot meal at one of our two on-site restaurants or have it delivered to you via room service. Looking to impress a client? Reserve one of our spacious meeting rooms, such as the sophisticated VIP room, and celebrate afterward with a drink at the Oasis Lounge. Please note that our swimming pool will be closed from February 4, 2019 to February 6, 2019. We apologize for the inconvenience. Whether you’re looking for authentic Chinese cooking or international comfort food, you can find it right here at the Radisson. Stop by the River View Café for buffets featuring global cuisine at breakfast, lunch and dinner. We also offer a full range of à la carte options. Discover the best of Chinese cuisine at Fortune Court, serving traditional local dishes with a modern flair. After dinner, invite your colleagues to the Oasis Lounge for conversation and cocktails, or order dessert delivered to your door with 24-hour room service. National Exhibition and Convention Center – Offering more than 500,000 square meters of indoor and outdoor exhibition space, the clover-shaped NECC is one of the world’s largest exhibition complexes. If you’re attending a trade show or a convention, our complimentary shuttle offers convenient transportation for the 10-minute ride. Shanghai International Circuit – Watch some of the world’s fastest cars participate in the Formula One Chinese Grand Prix, attaining speeds of more than 300 kilometers per hour. About 17 kilometers from the hotel, this challenging racetrack draws professional drivers from around the globe. Zhujiajiao – Drive just 30 minutes to step back in time at Zhujiajiao, an ancient village that features waterways for many of its roads. Take a boat ride through the “streets,” admire the centuries-old stone bridges, and relax in a serene garden or a traditional teahouse. The Radisson in Qingpu offers nearly 1,500 square meters of conference space, including four event rooms and a private VIP room. Take advantage of LCD projectors, microphones and an oversized LED screen for impressive presentations. Our 600-square-meter Grand Ballroom can accommodate 400 for a banquet or 600 for a cocktail reception, and your personal meeting butler helps to ensure that your meeting runs smoothly. Enjoy 24-hour room service near NECC ShanghaiMake Radisson Exhibition Center Shanghai your urban getaway in one of 226 spacious hotel rooms and suites. In addition to soothing contemporary decor, each of our rooms offers free Wi-Fi and 24-hour room service to help you relax. Get a jump start on your morning with an in-room coffeemaker and your choice of newspapers, and use the well-designed work desk to finish paperwork before heading to our on-site meeting space. Traveling for work? Book one of our signature Business Class Rooms to enjoy upgrades like a complimentary breakfast and complimentary drink vouchers. Get a great night's rest in our Superior Rooms, featuring standard amenities like minibars and free Wi-Fi. Ideal for corporate travelers, our signature Business Class Rooms offer all standard amenities, plus free soft drinks, cookies and breakfasts. Upgrade your stay by booking this suite, featuring additional space and all the benefits of the Business Class Room, including daily fruit platters and turndown amenities. This suite features upgraded amenities such as a separate living room, additional space, a free breakfast and special treats upon your arrival. For families and groups, our Radisson Suites offer the convenience of a separate living room in addition to all Business Class amenities. Treat someone special to an unforgettable stay in our Presidential Suite, featuring a lavish space perfect for any special occasion and covering more than 185 square meters. This suite is equipped with all of our finest amenities. Savor updated twists on classic Chinese cookingFeaturing chic dining rooms, fresh, flavorful food and warm, professional service, Radisson Exhibition Center Shanghai has the perfect on-site restaurant to suit your needs. After a meeting at the NECC Shanghai, head to River View Café for international cuisine thoughtfully prepared by trained chefs. At Fortune Court, guests can sample traditional Chinese cuisine crafted with an eye to modern plating and careful execution. After a busy day, be sure to stop by Oasis Lounge to relax over a cocktail with friends and colleagues. Featuring endless variety, this café satisfies any craving with international buffets and delectable à la carte items for breakfast, lunch and dinner. Discover the exciting flavors of China as you taste our signature preparations of traditional local classics. Whether you prefer a cold beer, a glass of wine or a cocktail, Oasis Lounge is the ideal spot to end your day. For delicious meals in the privacy of your hotel room, order from our room service menu.